As a teenager, Mantegebosh Zewede saw mothers not much older than herself suffering from fistula and decided then to become a midwife. Bahir Dar, Ethiopia — In the Amhara Region of northern Ethiopia, pregnant women traditionally give birth in their homes. Health centers are often too far to reach on foot, and villages are barely connected by dirt paths, let alone dirt roads. For pregnant women in need of help, these distances can prove tragic—a fact that Midwife Mantegebosh Zewede knows all too well. In August of last year, a weak and dying woman arrived at the Agita Health Center. Zewede and her colleague rushed to administer an intravenous drip and antibiotics in the hopes of saving her. They learned that the woman, Dagnanesh Yirdawe, had spent five days in labor, given birth to a stillborn baby and spent another six days with a retained placenta. Despite Zewede’s efforts, she couldn’t save Yirdawe, and the mother of seven children died at the center. Zewede, who was raised in a nearby village, began working last year at the health center in Agita, a small town nearly 60 kilometers from Bahir Dar, the capital of the Amhara Region. During the rainy season, the road becomes too muddy for vehicles and the community is isolated from the outside world. Obstacles such as poor communications and impassable roads have played a major role in the high maternal mortality ratio of 676 deaths per 100,000 live births. “I feel sorrow that mothers continue to die due to prolonged labor, excessive bleeding and fistula when prevention and treatment is simple,” says Zewede, who as a teenager decided to become a midwife after witnessing very young mothers suffering from fistula. In 2011, she got an opportunity to expand her knowledge and skills in maternal and child health by attending a training course on basic emergency obstetric and newborn care. Organized by Jhpiego through a UNICEF-supported maternal, newborn and child health program, this course is one of the many ways that Jhpiego, in collaboration with the Ethiopian government, is building the capacity of Ethiopian health care workers to provide high-quality health care services to women and families. Jhpiego has been working in Ethiopia since 2003, providing technical support to the Federal Ministry of Health and regional health bureaus in the areas of maternal and child health and HIV/AIDS. Most recently, Jhpiego launched an ambitious, five-year program, funded by the U.S. Agency for International Development, to strengthen Ethiopia’s health workforce and increase the number of skilled midwives, anesthetists and other essential health care providers in the country. For Zewede, her three weeks of practical instruction in emergency obstetric and newborn care gave her vital skills and the confidence to tackle common issues among pregnant women such as pre-eclampsia, eclampsia and shock. After the training, she managed one case of pre-eclampsia and promptly referred two eclampsia cases to Felegehiwot Hospital in Bahir Dar. All the mothers survived and are living with their newborns. 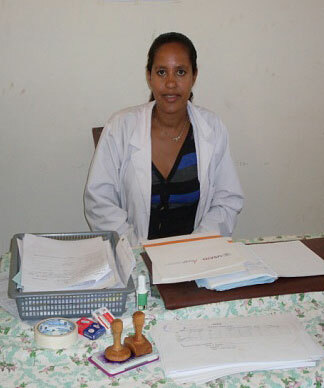 Equally important, Zewede emerged as a leader at the Agita Health Center and used her new skills to strengthen health care services for Ethiopian women and families. She persuaded all of the center’s midwives to design an outreach service to support health extension workers in rural areas. This enterprising initiative also aims to raise awareness among the community about the importance of focused antenatal care, recognition of danger signs, timely referrals, effective means of communication between clients and providers and ambulance arrangements. The outreach service has had a measurable impact. Since October 2011, the average number of new pregnant mothers attending the antenatal clinic increased from 40 to 85 per month, and the average number of institutional deliveries rose from 10 to 17 per month. Zewede believes the role of the midwife goes beyond the health clinic and should be that of intermediary between the community and the health center. “Now, no mother dies due to labor or delays,” she says proudly.